Suburbs Mama: Day in Life of a Stay at Home, Homeschooling, Mom! 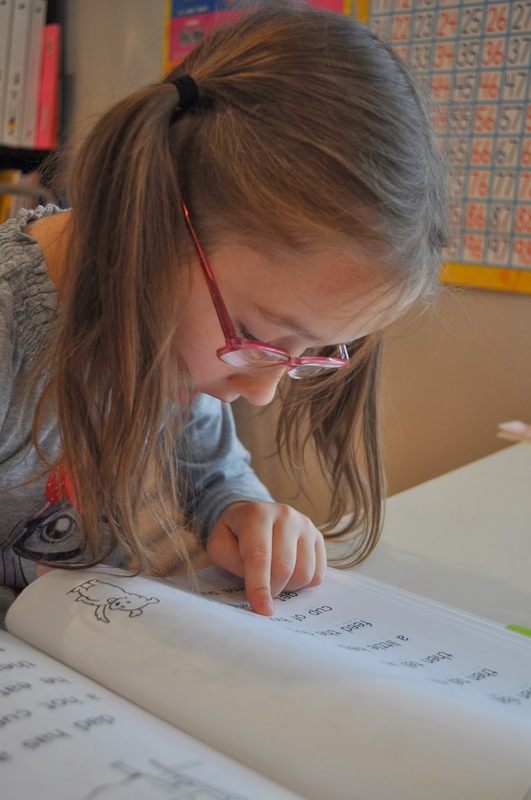 Day in Life of a Stay at Home, Homeschooling, Mom! 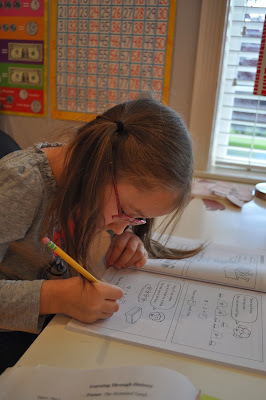 I have been meaning to do a post on how our homeschooling day goes, but I decided to go ahead and do a day in life post. These are a bit consuming, but I took the time today since it was a "stay at home day" as my daughter calls it. That just means we have no plans on going anywhere. I love these days. No errands, shopping, just home all day. Want to see what my Monday looked like? Keep in mind, every day is different as you can imagine. But we do homeschool Monday- Thursday without fail. Sometimes we may start in the afternoon, or earlier on in the day, but it gets done never the less. It is a lot less time consuming then I though it would be. Probably because Little Em is just in Kindergarten. I should start with last night, When we came home from the pumpkin patch, I took a nap because I was so exhausted. I napped for about 2 hours. Because of this I could not fall asleep till after 2am that night! I started a new book on audible to help pass the time till I could fall asleep. I was able to close my eyes and relax and listen to the book. I finally turned it off at 2:30am and fell asleep shortly after. Therefore I barely opened my eyes this morning at 8:25am. When the garbage truck made a ruckus outside. I lay in bed for a bit, I could see that hubby was gone and he had brought Little Em to my bed. (Little Em is a early riser, she wakes up with her dad, but he brings her to our bed in the morning when he leaves and she usually falls back asleep) Little Em and Nico were both asleep next to me. I slowly sat up in bed and picked up my lap top which was on my nightstand, I finished and posted my burp cloth tutorial and posted it. I stayed in bed till 9am and checked and replied to emails, checked Facebook and Instagram. I finally made it out of bed at 9am, the kids were still asleep. The kids are awake now. I go and give them hugs and we cuddle for a bit in bed. The kids get dressed and brush their teeth, tidy up their room and play room. Emily made her and her brother's bed. I did 3 loads of laundry last night, we always have a ton after the weekend. I put all the clothes away now. I threw in another load. I made my bed and cleaned up a bit. I took the time to wipe down both of the bathrooms and put clean hand towels in both bathrooms. Time to get dressed! You can usually find me in maxi skirts or leggings and tunics these days. It is what is most comfortable for me know. The kids run off to play in the playroom. I go downstairs and open blinds. I love the morning light! There is always dishes to do after my hubby leaves and all the water cups from last night. I clean up a bit downstairs. It was clean here last night! Hubby was up late last night with Nico. I check the menu, take out the chicken out to thaw out and start breakfast. Kids are still playing in the playroom. Breakfast is finally ready by 10:07am. I call the kids for breakfast. The Laundry is washed now, and I threw the laundry into the dryer. We start school at 10:35am. We did a craft (which I prepared ahead of time) and then we did dramatic play. Next we do music. The kids love to sing and learn new songs. After the "fun stuff" Nico runs off to play in the play room. From time to time, he comes back and sees what we are doing, asking if Emily can play yet. This is probably my daughter's least favorite part of school. She really does not like handwriting. By 11:30am handwriting is done. Phonics time: We use the Reading Lesson. I love this book. She has come so far and is already reading! We read 2 pages a day. One of the things I "add" to Little Em's lessons is spelling. We learn 3 words each week and take the test on Thursday. I use the Spell and Write. Kindergarten version. We are half way through, I need to order the 1st grade one soon. I also add more math to her lessons. I feel that the curriculum does not provide enough. I found this daily math book at goodwill for $2.99, it was not used. Love it! 11:50, little man decides to join us. He picks an activity from the shelf. He chooses the lacing beads. Last lesson of the day is math! Little Em always breezes through this. Done with lessons for the day at 12:06pm! 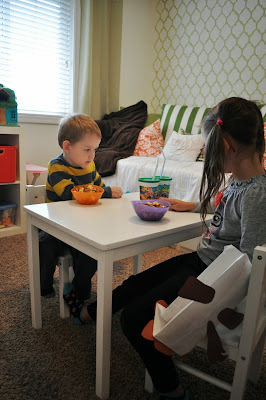 Kids usually eat their snacks in the play room while they are playing. I take this time to get tomorrows lessons ready. By 12:23pm, it is done. While the kids are playing. At 2pm, we are done with lunch. I put this little man to sleep. I honestly have never seen a child look forward to nap time so much as him! He gets so excited and runs to bed. I make dinner, clean kitchen, take trash out, wash floors and get the mail. Love it when the kitchen is clean and dinner is made! This is what Little Em does while her brother is sleeping. By now (3:30pm) I am so tired and feel like I want a nap by now. My pelvic pain is back and back aches. But I know Nico will be up soon, so I really don't want to bother with a nap. Plus what if it keeps me awake till 2am again? I don't want that to happen again. So instead I decide to tackle some sewing. At 4pm, Little man is up. He is grumpy. So I give him the i pad. He sits with me in the classroom and watches Big Big Friend on Netflix while I sew. By 5:30, hubby is home. I sew another pair of pants and hat for my sister. She is also having a baby boy- a month ahead of me. I finish with the sewing around 6pm and clean up the classroom. We have dinner/tea from 6:30-7:15pm. Hubby and I do the dishes and clean the kitchen. Stories are read and prayers are said. Kids are finally in bed. 10:15, hubby makes us some mozzarella cheese sticks, the smell lures me downstairs. Then all the kids join us too! They should have been asleep by now. They always do this, I purposely asked them at 9:00pm if they wanted a snack, they said no. We eat some cheese sticks, kids ask for cereal. Finally by 10:40, I clean the kitchen once more and tuck the kids back into bed. I take a shower and am in bed by 11pm. I am exhausted. I didn't get around to exercising, But I feel that I did a good 3 hours of walking at the pumpkin patch the day before, so I will get on the elliptical tomorrow. Well that is what my day looked like. No two days are ever the same. For example tomorrow we are going to the library, So we will do some lessons before we leave and the rest when we get home. Then on Wednesday I am planning on going to the mall because little Em outgrew her winter coat from last year and it has been getting colder. I like to go to the mall in the morning, so we probably won't start lessons until we get back in the afternoon when we put Nico down for his nap. Then on Thursday, we do lessons right after breakfast, then I clean the house, do menu planning and then we go grocery shopping. This is why I appreciate those days when we just get to stay home. I love reading "day in the life"! :) My girls are now in 1st grade and our homeschooling days are fun and Full! (Especially with two more littles underfoot!). Enjoyed the glimpse into your day. Wow! I'm impressed how you even fit sewing into your busy day! LOve reading day in the life posts! Sounds like a busy, wonderful day! What lovely pics! You've documented this post so well! Ok, so I'm not the only alien stay at home mom and wife.